1. Will the appointment booking system exist in the long term. There is hundreds of appointment booking systems available to choose from on the Internet today and you don’t want to find yourself with someone that does not exists in a couple of months. When selecting a partner to rely on with your appointment booking software, you should preferably select someone that is reliable and profitable and actively developing the software for the better. How can you know if someone can be relied on? There are ways but the best one is probably to simply ask for a credit report on the company. 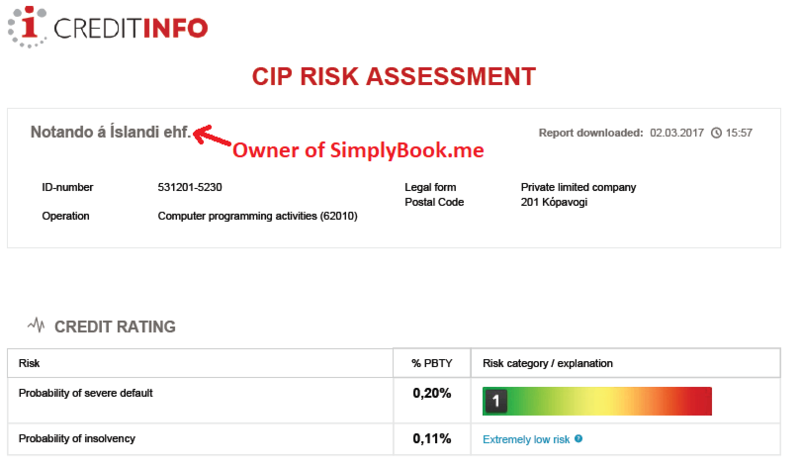 Below is a recent credit report on SimplyBook.me where it can be seen that risk of default is rated very small or far under 1% so it is likely it will be around for long time. Get a credit report on the company you are planning to do business with. You get twofold information here. First you when the domain was created, and secondly you when it expires. Serious companies usually buy the domain far in to the future as they plan to live for a long time. SimplyBook.me was however created even earlier or in 2009 under the name of DoReserve but in 2011 there was a name change. In 2017 the project was therefore 8 years old. 3. Does it have many features and is the system still being developed? You also need to look at what features are offered in the system and if the features will cover your needs. You want to see that you can have multiple providers and many users that can access the system, you may want users to have different access level, and providers will definitely need to have different work hours. You also want to see that you can have multiple services and that the services can have different duration. Very often you also want providers to be able to connect their Google or Office Calendar so they can see appointments and block times directly from there. A good dashboard where you have an overview over your business, site visits, bookings, cancellations, revenue etc can also be very useful. A good and flexible promotion system that allows you to promote services and create discounts can also help you to get more clients and create more revenues. Possibility to add the system to your Facebook fanpage can also be useful. 4. User reviews are also important. Capterra is the biggest reviews site for appointment scheduling system. The following is a screenshot from SimplyBook.me reviews on Capterra. Check reviews sites to see how the software is rated but look deeper into the reviews. Review sites can not always be fully trusted and we have seen solutions with loads of reviews where almost none of the reviewers could be found as a company. So if you look at reviews, you should also do a check if the reviewer actually exists as a company. Also check if the reviews are gradually coming in or if they all came in at a similar time as that is obviously not normal. Beware if all the reviews are positive and have no negative comments because in such cases it is likely that in fact that no real user is rating the company and that all the reviews were made by the company. It is absolutely normal for a company to have some negative reviews because no one solution can fit everyone, and many of those looking to give a review are often the unhappy ones. 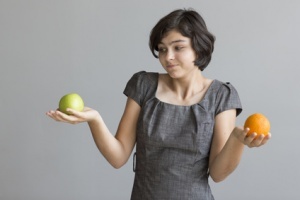 Can you sell products to clients when they finish their booking? How secure is the system, do they offer double authentication, for example SMS and/or Google authenticator? Do they offer HIPAA and SOAP? Is there a membership system? Can you sell packs of services? Will the system fulfill the new GDPR laws coming in May 2018and will the system also help you to fulfill your GDPR obligations? Does it integrate with many payment providers, or is there only a few that you can choose from? SimplyBook.me has been around and solving appointment scheduling needs for about 8 years. The company has been running with increasing profits for over 5 years and has 20 employees. There is live help for over 20 hours everyday on weekdays and for 6 hours over the weekend to help you set up your system. The system is extremely stable and has been tried by tens of thousands of users for many years. All the above mentioned features are in the SimplyBook.me system and many more. There is both a free trial with no obligations to continue. If you are a small business, you may even fit into the free version which has thousands of active users, that benefit from having a free online appointment system. Do your own research to find the best booking software. More appointment scheduling tutorial videos can be found here.